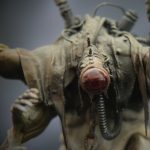 If you keep up with current GW events you have probably heard that the 40k storyline is advancing and Cadia is falling to Chaos. Drama. I decided to have a little fun with the theme and get some miniatures painted. This poor fella has seen better times. Perhaps he was part of a garrison on a faraway world when the news about Cadia reached them. Command and control quickly fell apart and soldiers went their separate ways. Maybe he was part of a retreating army and, in the chaos of a mass exodus, was left behind on a backwater outpost. Whoever he used to be, now he spends his days tugging at the sympathy of others so he can scrape together enough to continue his meager existence. This next guy went another route altogether. The fall of his home planet filled him with an insatiable desire to exact his revenge on the enemies of the Imperium. This maniac deserted his unit and loaded up on all the space-steroids he could get his mitts on. Now he plies the space lanes as a gun-for-hire, taking out his hatred and desire for revenge on whatever poor souls cross his path. The old codger with the sign at his feet is very well executed. Great job on the Merc too! Very different, but both great. I like the blond hair on the merc: reminds me of villains from 80s action movies! hell YEAH! those are both awesome! Cool! I love both concepts, so different yet so intertwined, hehe. Both such good ideas, each executed so well. 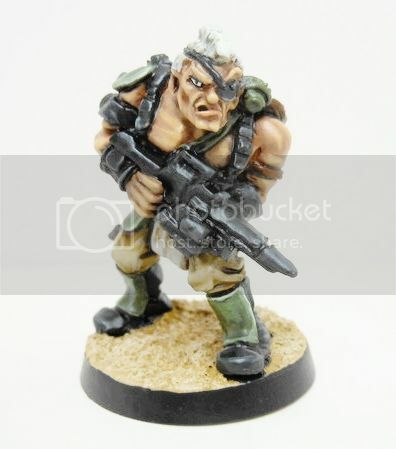 Of course I still haven't painted those Cadians I bought off you. 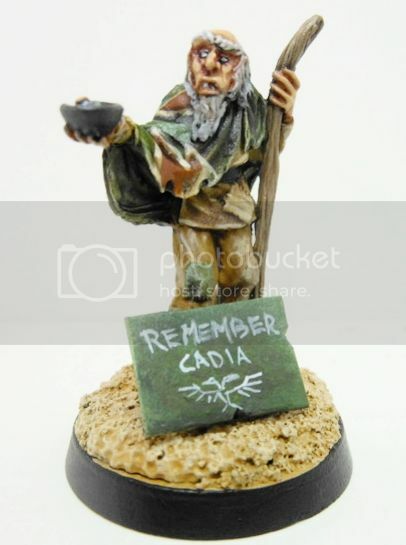 The remember Cadia sign is hilarious!